This article looks back at the films commissioned and produced by the Dutch government about their colony in the East Indies between 1912 and 1962. The main focus is on newsreels and documentaries about the colonial war between the Netherlands and Indonesia (1945 to 1949). The article discusses these films and their re-use in later television programmes. The programmes often look back at the colonial war in ways that go beyond the purpose of the original films and the article aims to show the methods that are used to do this. Contemporary colonial films have long been a neglected part of European film studies. In the last decade, extensive research on these colonial films in the UK has resulted in two books and an elaborate website.1 In France, another country with an extensive colonial history, a fully comprehensive scholarly study has yet to be published. In the Netherlands, colonial films have been a suppositious child generally ignored in Dutch film and documentary histories, and studies about colonialism itself seldom take films into account.2 The PhD dissertation, An imagined colony. The Dutch East-Indies in fifty years of government films 1912–1962, published in 2014, has been a first step in filling this gap.3 This paper provides a summary and a follow-up of this study, looking specifically at how films that were produced during the years of the decolonization war (1945–1949) have been re-used in television programmes.4 More specifically, it investigates how these films are re-used as archival footage and how at times their original message is altered in the process. In the past, this type of research was hindered, since both the original films and later documentaries and productions re-using this footage were on film, some still on nitrate. Due to an extensive digitalization programme in the Netherlands, called Beelden voor de Toekomst (‘Images for the Future’) a large majority of the original colonial films and television programmes re-using this footage have now been made available for study. In the 19th century, the Dutch possessions in the East Indies, which turned from a string of trading posts into an empire, included a well-organized Dutch administration imposed on the indigenous authorities. The need to map the whole archipelago and gain knowledge about the empire in all its vastness resulted in a surge of surveys being carried out by the end of the century. The first films, produced by the Dutch government in 1912, were part of this desire and need to control the empire. The fact that the government produced these films remained unknown until recently, due to these films never having been catalogued as such. Most of these films have been kept in the vaults of the EYE Film Institute, and, after further contextual information and metadata has been provided from written documents from the Dutch National Archive, the place of these films in film history can now be properly studied.5 As Peter Burke also acknowledged in Eyewitnessing: “Paraphrasing E.H. Carr it might be argued that before studying film, you should study the director.”6 In films produced by the government, the voice of the producer usually prevails. In the 1920s, there were few governmental colonial films produced. During World War I, the Netherlands adhered to strict neutrality and the government did not feel the need to use propaganda as other countries did. From the Dutch government’s point of view, the existence of their empire was so ‘natural’ that there was no need to defend, explain or promote it.7 By the end of the 1930’s, this complacent attitude began to change, at least in some circles. Once the Dutch metropole was invaded by Germany in May 1940, propaganda, including propaganda films, was treated as a useful tool for fighting the enemy. This remained unchanged in the immediate postwar years. Photo 1. 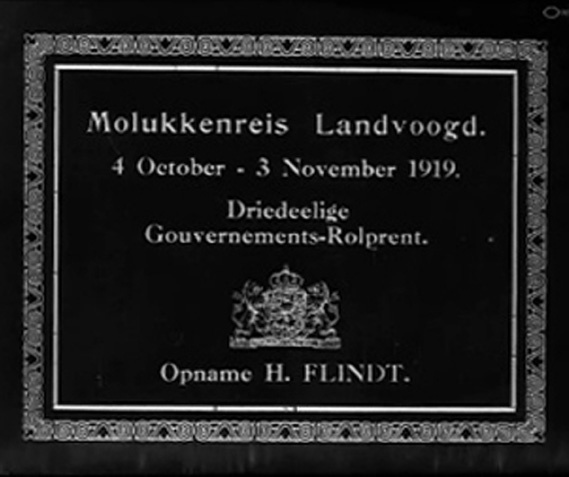 Title sequence from The Arrival of Governor-General Van Limburg Stirum in the Moluccas Year 1919. Go to the online version of this article to see the full video. Photo 2. 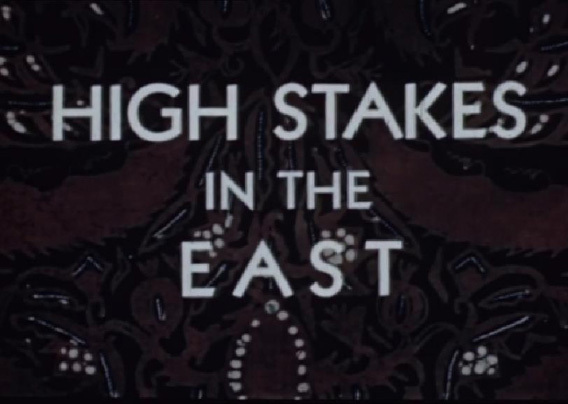 Title sequence from High Stakes in the East, 1942. Go to the online version of this article to see the full video. When lieutenant governor-general Huib van Mook returned to Java in October 1945, he discovered a changed Indonesia. The Japanese had surrendered on August 15, but there were no Allied forces on the main Indonesian island to enforce order. Moreover, on August 17th, the Indonesian nationalist movement declared the independence of the archipelago. Van Mook was at first willing to cooperate with the nationalists, but the Dutch government blew the whistle on him. It took the Dutch authorities four years to realize that the Dutch East Indies had essentially ceased to exist, four years in which a huge amount of films were produced to defend the Dutch position, that the colony could become independent in the long term, but for the time being Dutch assistance and governance was necessary to rebuild the country. Photo 3. 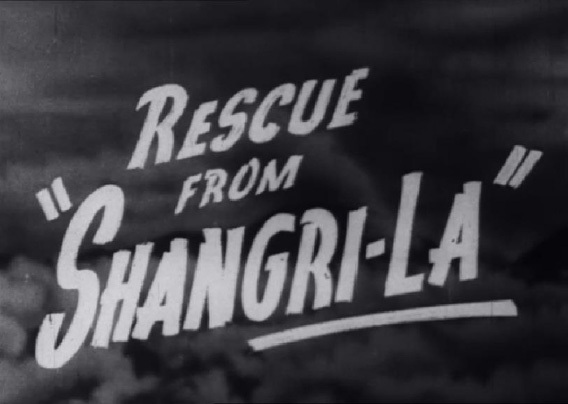 Title sequence from Rescue from Shangri-La, a film by the Dutch Government Film Service in Australia about a spectacular rescue of Americans in the interior of Dutch New Guinea. Go to the online version of this article to see the full video. Photo 4. 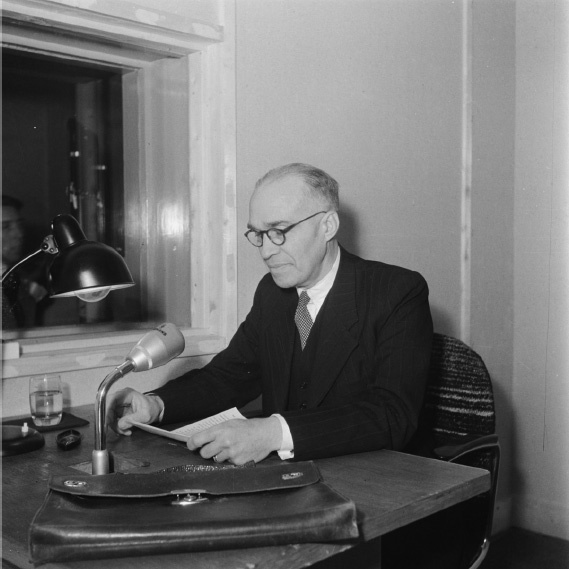 Minister of Overseas Territories Logemann giving a speech on the radio, in which he explains the government’s position on the Dutch East Indies in 1945. ©Anefo. Go to the online version of this article to listen to his radio speech. Photo 5. 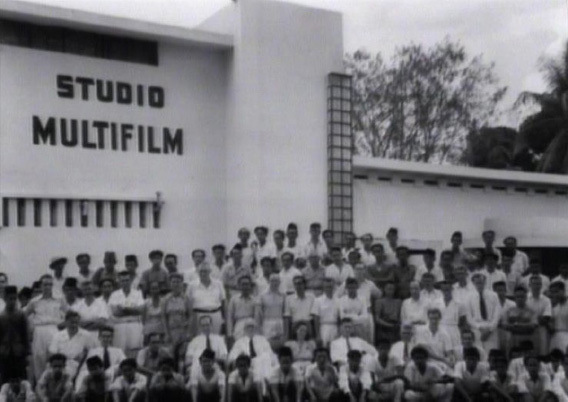 Studio Multifilm Batavia, ©Dutch Government Information Service. After the war, the government of the Dutch East Indies was the owner of all Dutch language media in Indonesia and people were well aware that this did not suit a democracy. In a policy document from 1946, this situation was described and condemned as inappropriate, but it also provided an explanation: because the war had destroyed all Dutch language media, the help of the government was needed to restore a proper media environment. And since rebuilding needed a ‘new spirit,’ it was deemed necessary that there would be, for the time being, a certain amount of government control over the media.21 This ‘for the time being’ lasted until the moment of the transfer of sovereignty at the end of 1949. The minister of Finance regularly pushed for selling the film studio, as the cost of film production was very high and films never made any profit, but this was never realized. Lieutenant governor-general Van Mook prevented it, because he remained convinced that films were an important means to circulate the view of the government to a wide audience, “a vital gear for the government,” as he had stated in 1938. Photo 6. 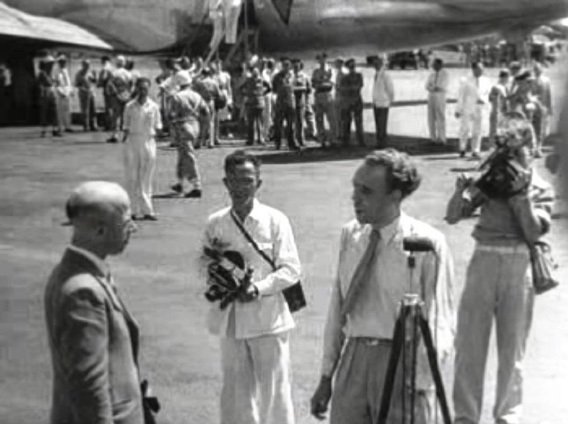 The arrival of Dutch PM Louis Beel at the airport Kemajoran in Batavia, where he is welcomed with the question: ‘Did you have a good trip, your excellency?’ Go to the online version of this article to see the full video. The long documentaries produced by the Gouvernements Filmbedrijf Multifilm Batavia form a special case. They were the pride of the company and at the same time most of them never got a movie theatre release in the Netherlands. Formal censorship did not exist in the East Indies, but there were of course ‘sensitive issues’ and in those cases the authorities wanted to judge a film beforehand. Linggadjati in de branding, a documentary about the first large military action the Dutch started in the summer of 1947, especially caused friction between the film studio and the authorities. Even after some changes, lieutenant governor-general Van Mook vehemently opposed showing the film in the Netherlands (the film was shown in movie theatres in Indonesia). Van Mook was convinced that the film would give the wrong image of the colony and that it showed too much war and destruction.22 Linggadjati in de branding depicts advancing tanks that are often greeted by friendly Indonesians standing alongside the road. Dutch soldiers are busy clearing roads from the debris left by ‘terrorists,’ they sometime lie in cover for expected snipers, but never is there any actual fighting to be seen (or heard).23 Probably Van Mook was so obsessed by his dream of a peaceful Indonesia that every image that could counter this dream was unwelcome. Photo 7. Linggadjati in de branding, a documentary explaining the military actions of the Dutch in Indonesia, 1947. Go to the online version of this article to watch part 1 of the documentary. The interview with Hueting was preceded by a short historical introduction of events in Indonesia, consisting of archival footage and a voice-over. Interestingly, the anchorman of the news show then told the audience that what they were about to hear next would not correspond to the footage they had just seen about these ‘police actions.’26 By 1969, images of the Vietnam War had become familiar for television viewers all over the world and constituted a new perception of what war looked like. The war fought in the East Indies was partly comparable to Vietnam: guerrilla warfare in a tropical climate, against an enemy that was undistinguishable from civilians. But in the case of the East Indies, visual resources were lacking. 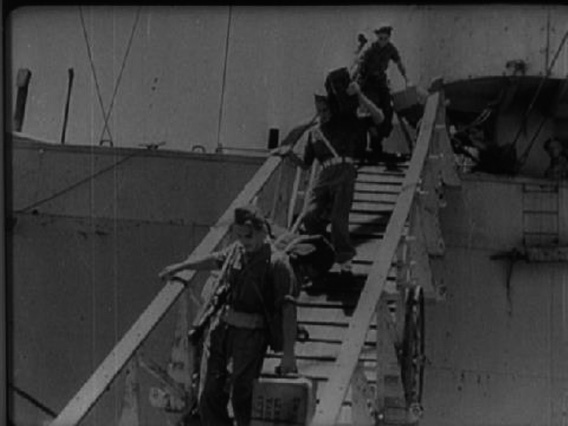 The government-produced films did not show war as was expected. No scenes of destruction, no marine with a Zippo lighting thatched roofs.27 In the years to come, this was a problem for all documentary filmmakers who wanted to tell a story about Indonesia in the years 1946–1949. Photo 8. Former conscript Joop Hueting talks about war crimes in Achter het Nieuws (VARA, 17-1-1969). Go to the online version of this article to see the full video. What solutions have filmmakers found to mask the lack of ‘telling’ footage from the colonial war? Were there specific shots that became popular for re-use? In a completely digitized archive, it might be possible to retrace every shot that has been re-used after its first broadcast, but even though most of the films from the Gouvernements Filmbedrijf Multifilm Batavia are now available in digital form, the system of retracing footage is not yet fully implemented and will probably be too costly to input retroactive data. For this paper, I went through roughly fifty documentaries, reports and programs about the colonial war that are known to have had a high profile and have attracted sizeable audiences. The topics they cover range from state visits to Indonesia to protests of war veterans against accusations of war crimes. This gives some insight into the different ways archival footage is used (or not used) in stories about the colonial war. 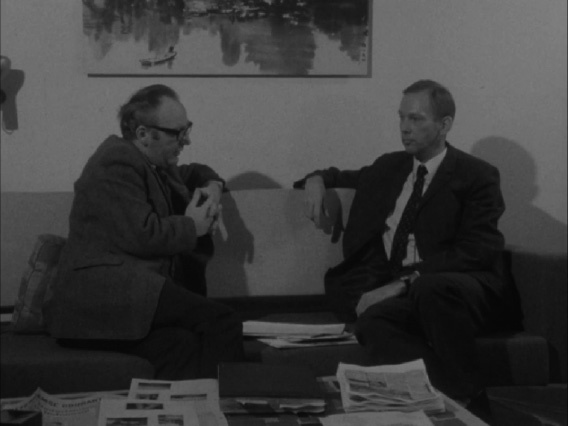 The accusations broadcast in Achter het Nieuws in January 1969 had some follow-up, but it took several years for television to pay attention again to what had happened in post-war Indonesia. The much-publicized and filmed state visit of Queen Juliana to the former colony (the first time ever the Dutch crown paid a visit) in 1971 was apparently not seen as an occasion to open old wounds. Neither television broadcasts nor movie newsreels mentioned war atrocities that had taken place in the past. But at the end of 1976, a three-hour long documentary was broadcast under the title Indonesia Merdeka of hoe Nederland de erfenis van Jan Pieterszoon Coen verloor (‘Free Indonesia or how the Dutch lost the heritage of Jan Pieterszoon Coen’).28 The filmmaker, Roelof Kiers, gave several interviews beforehand in which he stated that he had gone through all the government films of the time, expecting to find at least some images of war, but never found one.29 His documentary did not focus on war atrocities and crimes (as did Achter het Nieuws) but looked at the political and social aspects of the relationship between the Netherlands and Indonesia. Kiers did not have to tackle the problem of ‘illustrating’ gruesome stories. He did show the archive footage in an innovative way, by using the original editing and voice-over. Kiers hoped that it would be apparent for his audience, thirty years after the events, that these films constituted pure propaganda by the Dutch government. Photo 9. Still from an episode of Soldier Overseas (1948), in which a medical orderly helps local people. Go to the online version of this article to see the full video. To see Indonesia Merdeka (in two parts), click here and here. The most straightforward way to document historical events on film is by interviewing eyewitnesses. In Achter het Nieuws veterans talked openly about the war atrocities and crimes that were committed but their reactions were furious, denying any wrongdoings by the Dutch military.32 Since 1969, there has been a sometimes emotional public debate in the Netherlands about whether or not the Dutch had committed war crimes in Indonesia and if atrocities were standard policy or an exception to the general rule, which claimed that Dutch soldiers were supposed to protect and help Indonesian civilians and only attack ‘terrorists,’ something that was featured prominently in the government films. In August 1995, the documentary De excessen van Rawagedeh (‘The Excesses in Rawagedeh’) was broadcast. It was the first time Indonesian eyewitnesses talked about their war experiences on Dutch television. 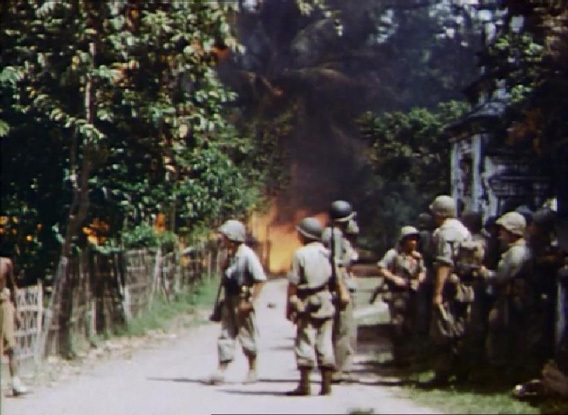 The documentary reconstructed events in Rawagedeh, a small Indonesian village on Java, which in December 1947 was raided by Dutch troops leaving many of the male inhabitants dead.33 This ‘notorious massacre’ was documented and condemned by an UN investigation at the time, but none of the perpetrators were ever prosecuted. The reconstruction of what happened in Rawagedeh was done through interviews with surviving Indonesian eyewitnesses and no archival footage was used (none was available of course). The programme caused shock, led to questions that were raised in the Parliament, and after a long legal procedure, the Dutch state took responsibility in 2011 for what had happened, offered apologies and paid a compensation to surviving widows of the murdered men. Photo 11. 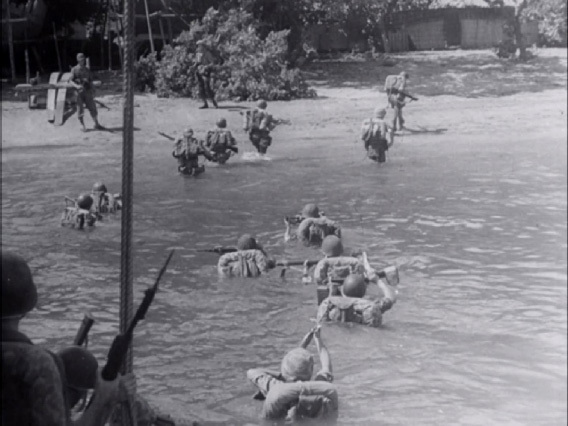 The landing of the marines at Pasir Putih, part of a longer movie newsreel about the Dutch military operation in the summer of 1947. Go to the online version of this article to see the full video. Colonial films have been carefully preserved in the archives. In Britain, an extensive research project about colonial films concluded that these films constituted an important part of what is called ‘imperial mythography.’35 In their day, most of the films made by the Gouvernements Filmbedrijf Multifilm Batavia failed to reach a large audience and therefore could be considered as failures. They were after all intended to convince the Dutch public of the good intentions of the authorities, making it believe that the war that was fought overseas was a good cause. 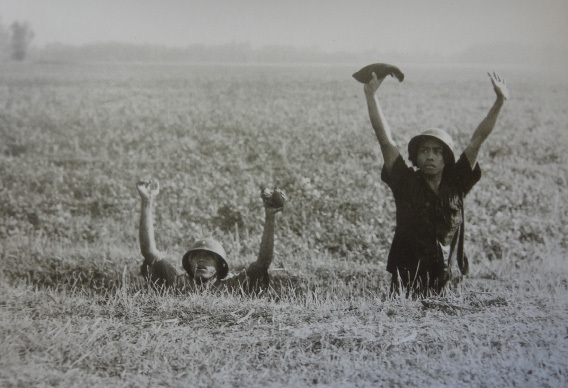 Public opinion polls never showed an outright majority in favour of sending troops to Indonesia, although subsequent coalition governments (including the Social-Democratic party) agreed to the colonial war. It seems safe to conclude that government films did not affect public opinion between 1946 and 1949. But they did have an effect when they were re-used in the television programmes from the mid-1980s on. Veterans then often pointed to the archival footage, where soldiers could be seen helping the Indonesian people. For them this was ‘proof’ that they had been sent overseas for honourable reasons. Forty years after the events, the propaganda of the government had finally struck a note. Now, almost sixty-five years later, the word ‘war’ is replacing the old term ‘police actions’ that was once invented by the government.36 It may be the start of a new approach to a war that is still sensitive in Dutch society. By the time the last veterans are no longer among us, it will be interesting to see if the ‘imperial mythography’ of the films is still effective; to see if the divide can be bridged between the two images that dominate Dutch collective memory: that of a nation whose military participated in a gruesome war in Indonesia or that of a nation whose military were ‘goodwill ambassadors’ in a far-away country that had to be assisted on its way to independence. Photo 12. Brigadeflitsen, footage shot in 1946 by the Marine Information Service. Go to the online version of this article to see the full video. Dr. Gerda Jansen Hendriks finished her MA studies in modern and theoretical history at the University of Amsterdam in 1984 and has since worked for Dutch Public Television. She was a foreign-affairs reporter for features such as Panoramiek, Diogenes, NOS Laat and NOVA and directed episodes for several historical series, among which was the The Iron Century (2014). She devised the format of the weekly history magazine Andere Tijden that started in 2000 and has since been working as a director for this programme. In 2014, she completed her PhD with a dissertation about government-produced films in the Dutch East Indies from 1912 until 1962.